A thermos is a container that is used to keep items—usually food or drinks—hot or cold over a period of time. It uses thermal insulation to prevent or inhibit the transfer of thermal energy from one area to another. The principle involved consists of surrounding a container with material that is a good thermal insulator, which is a material that will not conduct heat or cold. A unique way of keeping material its original temperature is to use a vacuum as an insulator. What are the factors involved in a thermos? What makes up a simple thermos? What is a vacuum thermos bottle? A thermos is a container that is surrounded by a good thermal insulator. If the material inside the thermos is hot, it does not let much of the heat or thermal energy escape to the outside. Likewise, if the material inside is cold, heat from the outside is prevented from reaching the inside. Factors involved in a thermos are heat transfer and insulation. One object will transfer heat to another object that is in contact by conduction. If the two objects are not in contact, and there is a liquid or gas between them, the heat can be transferred by convection or motion of the fluid. If the objects are separated, heat can also be transferred by radiation. Some materials transfer heat by conduction better than others. For example, metal is a good conductor of heat. Thermal insulators are materials that are poor conductors of heat. They are also called good insulators. 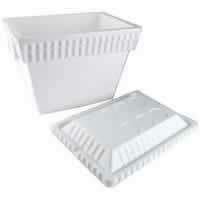 Styrofoam is an example of a good thermal insulator. A simple thermos is made of an insulating material that will inhibit transfer of heat. A Styrofoam cooler is an example of a simple thermos container that prevents outside heat from warming up its contents. Instead of using some insulating material inside a container, a vacuum is used. Such a thermos contains an evacuated chamber that acts as an insulator. Since a vacuum contains no matter, it cannot transfer heat by conduction or convection. But radiation heat can be transferred through a vacuum. 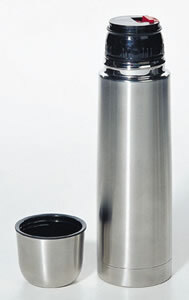 To prevent that type of heat transfer, most vacuum thermos bottles have their inside silvered to reflect the radiation. People often use vacuum thermos bottles to bring hot drinks, soup, or iced tea to work. A thermos is a container that is used to keep items hot or cold over a period of time. A simple thermos consists of a container surrounded with material that is a good thermal insulator. A unique way of keeping material at its original temperature is to use a vacuum as an insulator.